Around 353,000 people have taken shelter in 3,026 relief camps as thousands of army, navy and air force troops fan out to help those still stranded. The death toll from the worst flooding to hit India’s Kerala state in a century has jumped to 357, authorities said Sunday, with losses to infrastructure pegged at some $3 billion. The idyllic tourist hotspot has been battered by torrential monsoon rains since the end of May, triggering landslides and flash floods that have swept away entire villages. 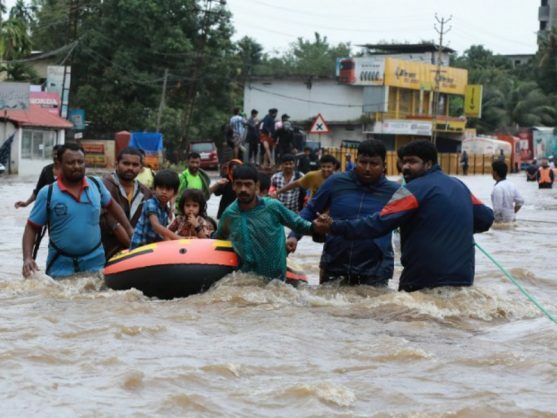 “Since May 29, when the monsoon starts in Kerala, a total of 357 people have lost their lives until now,” a statement from the state’s information officer said, with 33 losing their lives over the last 24 hours. “According to preliminary estimates Kerala’s losses due to the floods is 19,512 crore rupees ($2.9 bln). Actual losses can be estimated only after the water recedes,” the statement said.